Women talking in group therapy session © Masterfile - Person(s) appearing in the above photograph are models and used for illustrative purposes only. 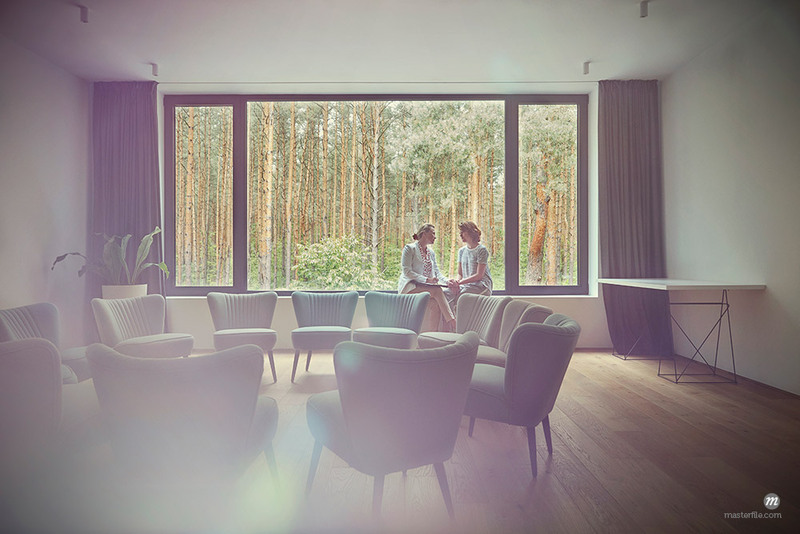 Women talking at window in group therapy room © Masterfile - Person(s) appearing in the above photograph are models and used for illustrative purposes only. Close-up portrait of young man outdoors wearing red hoodie © Uwe Umstätter / Masterfile - Person(s) appearing in the above photograph are models and used for illustrative purposes only. What does this mean to you? First of all, there are a wide variety of illustrations (always a safe bet) that suit mental health campaigns, websites, articles and social media posts. Second, at least at Masterfile, rights-managed images can sometimes be cleared for sensitive issues. You just need to reach out to your sales team to start the process. Almost all rights-managed and royalty-free images available for licensing have model releases and we can check whether the model release for that image allows for your particular campaign. While some releases grant broader usage rights than others, each model release has to be checked individually and this can take time—remember, there may be more than one model release per image. If your deadline is looming, it’s good to have additional photos or illustrations as backup. Whether or not you can move forward with the images you’ve chosen depends on your creative too: how the images and language work together as well as the overall context. Provided the model releases check out, there may be no issues with using positive portraits, optimistic lifestyle images, pictures of mindfulness or shots of group therapy in a general campaign that advocates for preventative care. Once the focus shifts to a specific mental illness (depression, schizophrenia, bi-polar and others), that may no longer be true, but don’t assume the answer is no. Aways reach out to your sales team for guidance. Serene people with eyes closed in audience © Masterfile - Person(s) appearing in the above photograph are models and used for illustrative purposes only. Even though it smacks of “fine print”, for added protection you can (and may sometimes be required to) indicate beneath the images that the person portrayed is a model and used for illustrative purposes only. This can be done in a discrete way that won’t detract from your campaign. How photo agencies define sensitive issues continues to change. After all, sensitive issues exist because of negative associations in the general population and those linger thanks to outdated language and visuals in the media. For mental health, maybe we can work together to change the picture. Women standing and talking in group therapy session © Masterfile - Person(s) appearing in the above photograph are models and used for illustrative purposes only.